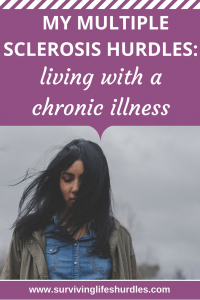 Welcome to the second article in my series exploring the different MS hurdles I face in life. I’m going to be sharing my current experiences of living with MS and want to give you fair warning that it may be uncomfortable reading, particularly if you’ve been recently diagnosed with MS yourself. I’m going to be completely honest about the major hurdles I face, not because I want to scare you or to gain sympathy but because to sugar-coat them isn’t realistic or helpful to anyone, including myself. I also want to point out that MS is different for everyone so the illness may not impact on your life in the same way or to the same extent as it does mine. In my first article I shared my experience of receiving a MS diagnosis and whilst that was difficult to endure it pales in comparison to the daily struggle and inner strength required to live with MS day in and day out. The reality is that my life has changed so much since my diagnosis 18 months ago and I’m still adjusting to the limitations I now face. I really can’t tell you how amazing it would be to wake up one morning and for this to all to have been a bad dream! Now don’t get me wrong, I’m generally quite a positive person and didn’t start this blog to ask you to join my pity party but I would be lying if I didn’t acknowledge from time-to-time the sheer frustration, fear, hopelessness and sacrifice that comes hand in hand with living with a life-changing, chronic illness like MS. I’m pretty sure that even the hardiest of people would feel the same way too if they were walking/staggering in my shoes. Imagine that you never touched a drop of alcohol but every day you woke up with a hangover. Some days the hangover would be milder but other days it would feel like the worst hangover of your life and you never knew which you were going to get. How easy would it to be to continue on with your life as normal, trying to keep everything running smoothly day after day? As hard as you tried you couldn’t do it, not successfully and over a long period of time anyway. How about trying to get to that important meeting/event you arranged when it was a really bad day? Unlikely, probably unsafe to do so and at the very least exhausting (the sort of exhausting that you don’t just bounce back from after a good sleep either, more like the kind that takes it out of you for days regardless of how much you rest). That is the basic underlying structure of what MS feels like for me. It’s hard to make plans when you know you’ll feel bad, you just don’t know exactly how bad. There are also loads of other symptoms that come and go to varying degrees which keep me on my toes too. So, for example, for a few days I may find walking difficult, then my body becomes a pain magnet, my head feels more dizzy and full of fog than usual or my levels of fatigue sky rocket. If I’m very lucky this won’t all happen at once! Now imagine you experience all of the above but you don’t actually look ill. How much sympathy and understanding could you expect to encounter? Definitely plenty from the people who know you well and who care enough to take the trouble to ask you what problems you are facing each day but even then, sometimes your limitations can be all too easily forgotten (let’s face it, with your symptoms being so variable you forget your limitations sometimes too and then suffer the consequences). How is someone who doesn’t understand your condition most likely to respond to you? I’ll tell you how as I experience it every day to one extent or another; like you’re either rude, lazy or somehow a lesser human being (although there are, of course, many exceptions). The disapproving look you get when you’re in your 30s yet you need to sit down on busy public transport or when you nearly walk into someone because your balance is off is sometimes irritating, often lonely and always exhausting. The hardest of all though is when you’ve explained your condition to someone and they still aren’t interested in understanding it, especially if you’d always considered them a friend. If your illness is clearly considered an inconvenience or you just aren’t worth the extra effort required on their part you can begin to feel worthless and lacking (until you realise that this person’s selfishness is the problem and not your illness, then you just feel angry). If hadn’t had my BIG relapse I don’t I think I’d be aware of just how scared of MS I could be. If I’d received my diagnosis earlier I think I would just have considered MS to be a mild annoyance which set me a little bit apart from ‘normal’ but my life could go on pretty much as normal. However, since that relapse I now have a better understanding of how devastating an illness MS can be, how life-changing and all-encompassing and also, aside from taking the best treatment options currently available, how little control you have over your disease. Now, as much as I try to push it aside, my life feels constantly tinged with fear over what MS still has in store for me. Also since my BIG relapse my life looks nothing like it did before it and I have many more limitations I’m forced to live with every day. From the age of 30 I could no longer drive regularly, spend the day looking after my son independently, walk long distances, get through the day without regular rests, work as a teacher (which I tried to go back to without success) or muster up enough energy for a lot of things I used to take for granted. This is hard to accept and adapt to and the people around me are still finding it difficult too, although we try our best to make it work. It’s hard not to get angry about my limitations, especially when you ask yourself ‘what did I do to deserve this?’ but that’s when I have to remind myself about all of the positives I do have in my life and focus on those rather than the things I don’t. All of the limitations I’ve listed make me a lot more dependent on others and I’m always having to ask for help. As a strong-willed woman who should be in the prime of her life I find this so humiliating and frustrating, especially as I have a young child who I can’t take care of on my own for any long periods of time. Not always being able to be there for my son has really knocked my confidence as a parent and I feel sad about what I can’t give him every single day. As much as I will always appreciate the help of those close to me there is a lot of indignity in being dependent, I feel like I’m a child again when I ask my parents for lifts to medical appointments and I also feel guilty if I think I’m relying on everyone around me too much. The fact of the matter is that the more an illness changes your life the more different your life becomes from most other peoples’ lives and that in itself can be isolating. 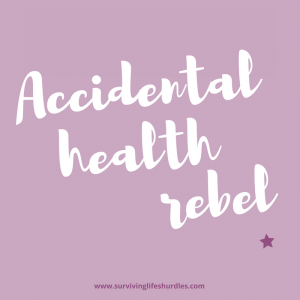 I sometimes feel like an accidental health rebel because, through no fault of my own and not for lack of trying, my illness has made it impossible for me to fully fit into society and live a normal life. I follow a different path now and that is just the way it is. As I don’t look ill I can sometimes pretend that I’m just like everyone else but inside I know I’m not, I’m viewing normal life as an outsider. To sustain the illusion I’m not ill for any length of time uses up all of my energy and leaves me completely exhausted. That’s why I think it’s really important to find people who are also experiencing a chronic illness to share your thoughts and feelings with. As much as your close friends and family will try to understand and offer you support no one can quite comprehend what you’re going through like another who shares your pain. They can help you to accept and manage your new normal, ensuring you feel less isolated from the old, I know this has really helped me. I think a life-changing illness has to be included in the list of things which most change how you view life. I see everything differently now, it’s like my eyes have been opened to the world around me rather than just being able to see ‘my’ world. I was definitely guilty of this sort of self-centred behaviour before I got ill and failed to see the bigger picture. Now this selfishness has been stripped away and I care so much more deeply about other people and the real problems they are facing in life. As the emphasis in my life has changed, I have a lot less time for the everyday gripes of self-absorption and recognise them for the non-problems that they are. I’ve gained more compassion and understanding now I realise that life doesn’t owe me anything. I truly appreciate the positives in life and I will never again take them for granted. I’m very grateful to the people who have rallied around me, the opportunities I still have and of course my little boy who lights up my life in so many ways. To help me focus on the positives I’ve set myself a few goals for the year and decided to focus on making the most of the new life I have rather than trying to do the impossible by recapturing the old. A lot of the symptoms and experiences I’ve briefly touched upon in this article, such as fatigue, relapsing and receiving treatment for MS deserve covering in a lot more depth and I’ll make I sure I re-visit them in the future articles of the series. So until next time, let me know what living with a life-changing, chronic illness is like for you? Do you experience any of the same thoughts and feelings that I do?